The Federal Open Market Committee held a two-day meeting on Tuesday and Wednesday, and the decision on rates was released at 2:00 PM Eastern Time on Wednesday. The committee did exactly what people thought it would do, and left the target rate exactly where it is. But, the committee surprised everyone with the statement that accompanied the rate decision. The FOMC stated that it will keep the target where it is for the remainder of 2019, and that was a big surprise since the majority of experts felt there would be at least one more rate hike this year. What was really interesting was watching the reaction of stocks and treasuries after the announcement. The initial reaction from stocks was to the upside, and that is what I would have expected given the circumstances. A clear indication that the Fed intended to leave rates where they are would be a plus for equities as it would remove one of the uncertainties investors faced. Ideally, lower interest rates help business growth as it is cheaper for companies and consumers to borrow and that can boost economic activity. 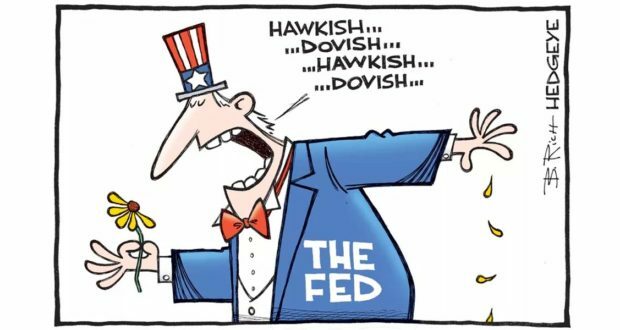 The confusion came about 40 minutes after the initial release from the FOMC as Fed Chairman Powell started his press conference to answer questions about the meeting and rate policy going forward. If we look at a 10-minute chart on the S&P, we see that stocks were down modestly prior to the rate statement release. 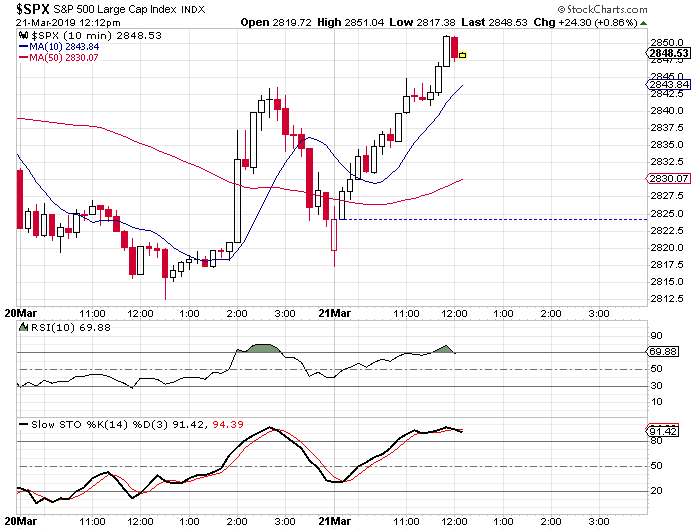 The S&P then rallies sharply and moved into positive territory until around 2:40 PM. The index then fell sharply and ended up closing the day near breakeven. Obviously, the Fed made the decision to keep rates where they are because they see the possibility of weakness on the horizon. If the Fed saw continued growth or even stronger growth they wouldn’t have changed their stance so drastically over the last few months. The Fed first moved to a more dovish stance at its January meeting and that spurred a jump in stocks as well. The reaction from the treasury market was far more definitive. 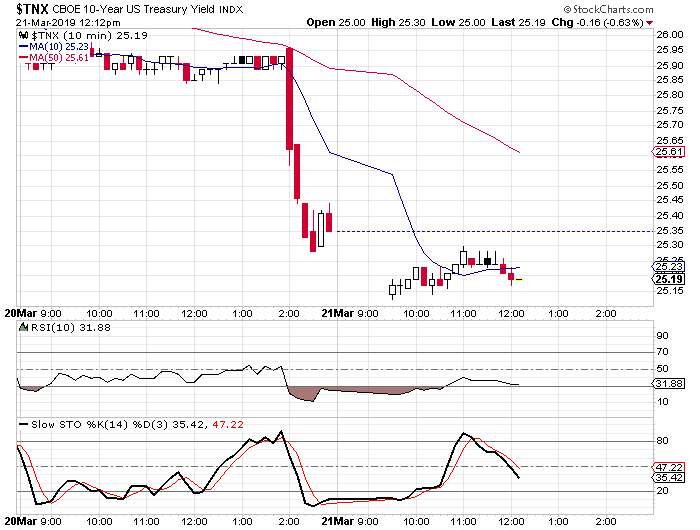 Looking at a chart of the yield on 10-year treasury notes we see a sharp drop at the 2:00 PM time frame. The yield dropped from the 2.59% range to 2.53% within the first 40 minutes. The yield reversed course ever so slightly when Chairman Powell started speaking, but the reversal wasn’t nearly as severe as what we saw with stocks. The yield continues to fall on Thursday morning as bond investors were convinced they needed to buy bonds, thus driving the yield down. The yield hadn’t been down in the 2.51% range since January of last year. Another thing that happened after the Fed meeting was the spread between the 2-year treasuries and 10-year treasuries dropped sharply. The reason for this was due to the yield on the 10-year falling much more sharply than the yield on the 2-year. The spread dropped to 0.14% on Wednesday and by Thursday morning the spread was down to 0.114%. I have mentioned the 2-10 spread in previous articles as it is closely watched as a sign of impending recession. When the 2-year is yielding more than the 10-year, historically it has been a sign of contraction in the economy. They haven’t inverted yet, but the 11-basis point spread is the lowest we have seen since the summer of 2007. Now the next question is, does the Fed see a recession on the horizon or will the yield curve invert and was it induced by the Fed? In an article earlier this week, I took a less cautious stance about the stock market because investors had taken too much money out of stocks in recent months. Big market selloffs don’t happen when investors are cautious they happen when investors are euphoric and have too much money invested in stocks. The Fed may have just added the latest enticement to investors to change course and start adding to their stock allocations. Unfortunately they did so because they see trouble coming.